According to Giving USA 2018: The Annual Report on Philanthropy for the Year 2017, total charitable giving in the United States grew by 5.2 percent to $410.02 billion in 2017. This marks the highest total amount given in the 40 years Giving USA has tracked this data, both in current dollars and when adjusted for inflation. Giving to religion continues to capture the largest percentage of philanthropic dollars (31%) of all subsectors by far, despite having the slowest positive growth rate at 2.9 percent in 2017. This is a continuing pattern of slow growth over the past several years. 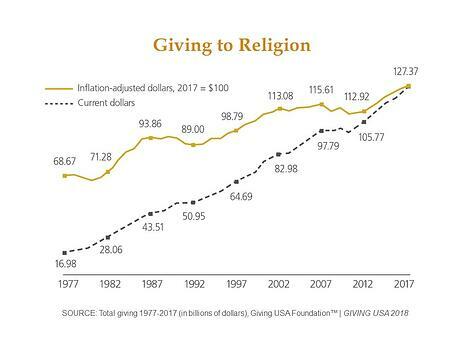 With total giving of $127.37 billion last year, charitable giving to faith-based organizations continues to grow overall, despite a national trend of decreasing affiliation with and attendance at religious institutions. Among the major Protestant denominations and Catholic and Jewish faith traditions, all have experienced the downward trend in affiliation and attendance. Interestingly, research shows that any form of religious affiliation increases an individual’s average annual charitable contributions overall. Millennial donors are more active in religious organizations than one might expect. According to a 2017 study by Dunham+Company and Campbell Rinker, the top two charitable recipients of Millennial philanthropy are places of worship and other faith-based organizations. Twenty-five percent of Millennial donors surveyed attend a religious service at least once per week, compared to 27 percent of GenXers, 28 percent of Baby Boomers, and 36 percent of Matures. It is important to note that for the purposes of the Giving USA report, religious organizations included focus only on congregations, missions, religious media, and other related organizations. If all houses of worship and all religiously oriented charities (e.g., schools, hospitals) were included in this category, up to 75 percent of all charitable giving could be considered religious in nature. Pursue connections with non-religiously affiliated donors as well as those who are religiously affiliated. As religious affiliation continues to decline, it will be essential to engage potential donors and volunteers who are outside of the traditional circle for your organization. Assess how to identify potential donors who may have an interest in your mission and specific projects. Develop creative ways in which individuals who are not affiliated could get involved with your organization and how to communicate those opportunities in an effective way. Continue to invest in your web and social media presence. As attendance continues to decline in most religious institutions, it becomes more and more important to provide a robust web and social media presence to keep congregants and others involved in the life of the organization. Provide multiple ways for individuals to connect, including live streaming services, podcasts, posts to both promote and report on events, reminders for various activities, useful resources for education and assistance, etc. Ensure that your online giving platform is up-to-date and easy to navigate. Giving online has become increasingly preferred among religious donors, as in other subsectors. A recent report by Blackbaud indicates that faith-based organizations experienced a 5.9 percent increase in total online revenue in 2017. Automatic donations, in particular, are a win-win: they provide donors an easy and effective way to contribute and the organization benefits from both the regularity of donations as well as the ease of processing and tracking. Source: Giving USA 2018: The Annual Report on Philanthropy for the Year 2017, published by Giving USA Foundation, a public service initiative of The Giving Institute, researched and written by the Indiana University Lilly Family School of Philanthropy.